Situated in the heart of Europe, SPARKY has held a firm belief in total quality control throughout its 50-year history. Specialising in power tools, seeing a contractor choose one of their expertly crafted items is a reassuring sign in any job. Widely recognised for the use of red and purple hues, there's almost an artistic quality to each piece of equipment. Comfort and practicality don't always go hand in hand, but SPARKY's streamlined and expertly designed pieces somehow find a way. The superior grip offered with their range of saws and drills will ensure a superior finished product, whatever the project. Proudly marked with the iconic diamond logo, the quality is plain for all to see. 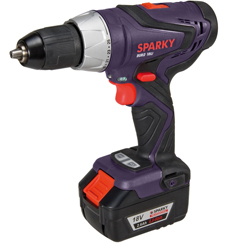 For more complex jobs, tools like the impact power drill or angle grinder showcase highly protective qualities. Perfect for risky jobs with dangerous surroundings and sensitive work areas, there's no real price that can be put on keeping workers safe. SPARKY's approach to quality testing offers total peace of mind with every purchase. From standard DIY jobs to fantastic feats of construction, the worlds of woodwork, metalwork and specialist builds haven't been the same since the business appeared in 1961.